Reading Habit makes it easy to read about the things you’re interested in. We’ll take away the stress of finding that perfect article, so that you can spend more time reading! We know how hard it is to find something worth reading. With just one tap, you’ll find yourself immersed in one of our curated long-form articles, from biographies, case studies, commentaries and more. 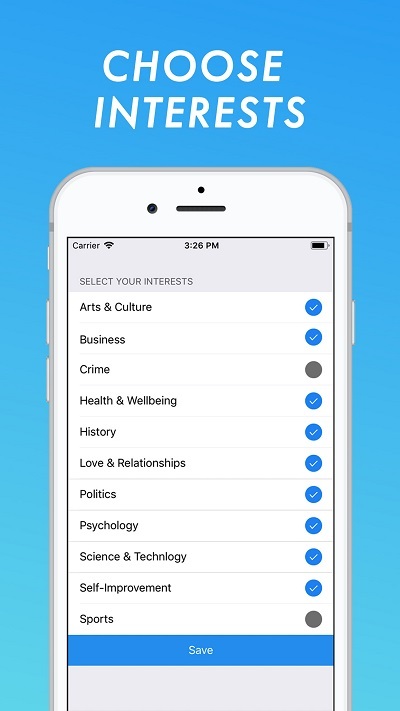 When you first sign up, you’ll be asked to select your interests. Don’t worry, you can add or remove interests at any time afterwards. 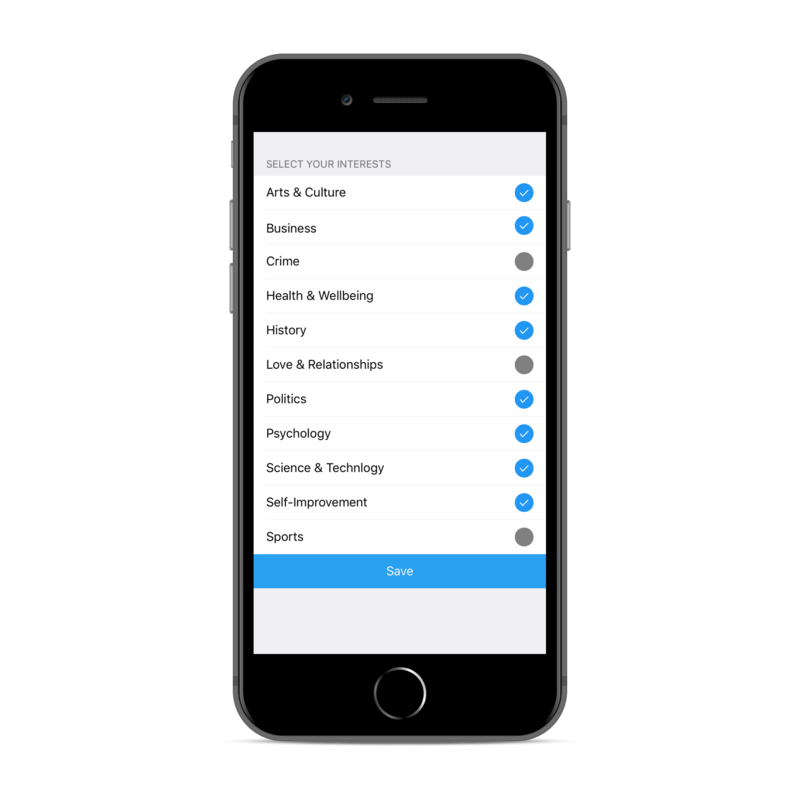 Every time you open the app, we will give you a random long-form article based on your interests. Each article is at least 3000 words long. 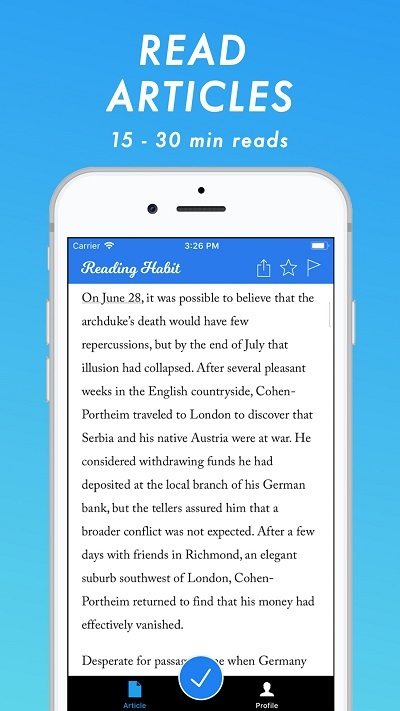 If you enjoy using Reading Habit, please consider supporting us. Maintenance can be expensive, but your contribution helps keep Reading Habit ad-free for everyone! Just choose your interests and let us find the articles for you! Reading Habit is super easy to use. We’ll show you how in 30 seconds! Feel free to send us an email if you can’t find the answer to your question here! How does Reading Habit work? Our team curates quality long-form articles from all across the web and categorizes each article by topic. When you create an account, you’ll choose your interests. Then, we match your interests with our topics to deliver articles that we think will be interesting to you. Why are the articles so long? We aim to curate articles within the 3000 to 6000 word range. That means, for the average reader, it should take between 15 minutes to 30 minutes to read an article from beginning to end. There are lots of cognitive benefits to reading, including but not limited to: increased focus and concentration, improved memory, better communication skills, improved analytical thinking and of course, more knowledge. However, many of these benefits are lost when we only read short-form articles, which is the trend we see in the media today. 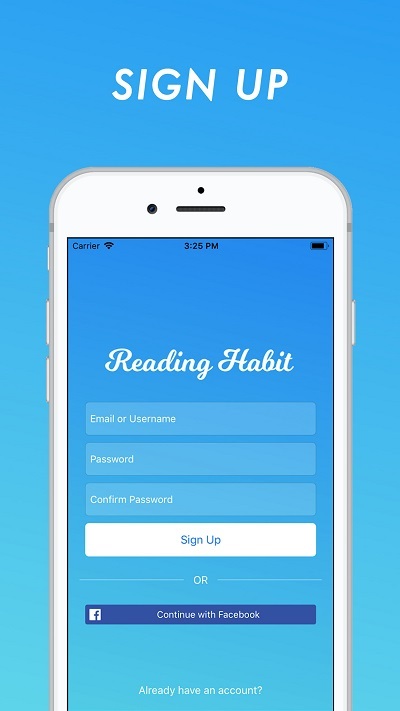 We’ve become accustomed to sound bites, clickbait titles and five minute articles that bring us instant gratification, but Reading Habit aims to reverse that trend by providing a platform for everybody to do a bit of real reading every day. Can you add this awesome feature I have in mind? We love it when our users tell us what they want! We’re always trying to bring you a better reading experience, so feel free to send us your feedback and ideas through our contact form or Facebook page. Please keep in mind though, that we are a very small operation of volunteers! We have no investors or institutional backing, so our capacity is limited. But every now and then, we will hear a great idea and work hard to implement it! How can I support Reading Habit? We’re thrilled that you’re enjoying our app! We’ll work hard to bring you the best experience, but since Reading Habit is free and does not contain our own ads, we could use a bit of help. You can provide financial support by donating, and no amount is too small. We sincerely appreciate your generosity and hope that you’ll continue to enjoy Reading Habit! 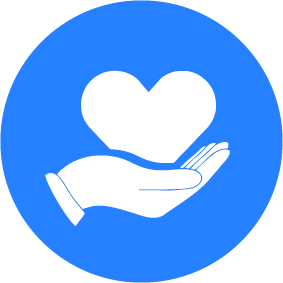 If donating is not an option for you, please consider leaving a review on the App Store and telling your friends about the app. 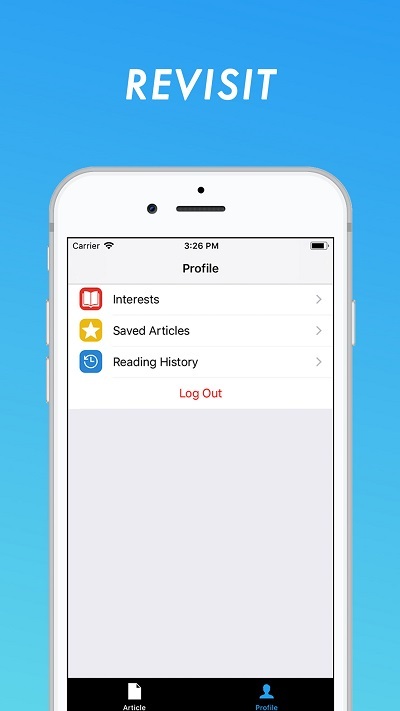 This will help us bring in new users who want to their improve their reading habits! Why am I stuck on the home screen? Reading Habit requires an active internet connection to function. If you are stuck on the home screen and unable to sign in, please check your internet connection. If this problem persists, please send us a message. Why can’t I sign up or log in? Reading Habit requires an active internet connection to function. If you are having trouble signing up or logging in, please check your internet connection. If this problem persists, please send us a message. How do I report a bug or glitch? We take our user experience very seriously, so we encourage you to report any bugs or glitches. You can do this by sending us a message on our contact form or Facebook page. 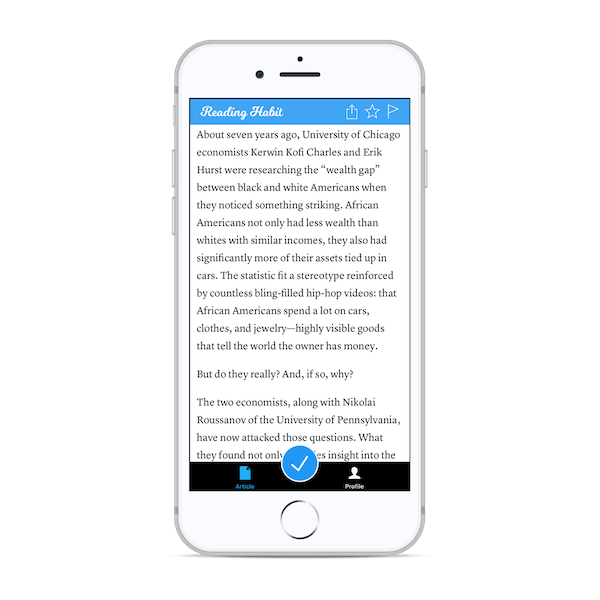 There are many benefits to reading 20 minutes every day, and with Reading Habit, you’ll find improvements to your concentration, memory, analytical thinking, and knowledge just one tap away! Please reach out if you have any questions or concerns about Reading Habit. You can fill in the contact form, send a direct email or call us. Alternatively, you can drop us a message on our Facebook page. We look forward to hearing from you and will get back to you as soon as possible!